Heat a dash of oil in a frying pan. Brown the meat in batches for approx. 5 mins., dust with flour, remove from the pan, season with salt. Reduce the heat, wipe the cooking fat from the pan, add a little oil if necessary. Finely chop the onions, crush the peppercorns. Sauté the onion, pepper and bay leaf for approx. 3 mins., pour in the wine and reduce to half the amount. Pour in the stock, bring to the boil, reduce the heat. Return the meat to the pan along with the cooking juices, cover and cook over a low heat for approx. 2¼ hrs. Mix the cornflour with the water, add to the meat while stirring and cook for approx. 2 mins. Cut the pears into slices, mix the pear slices in a bowl with the syrup and lemon juice, spread onto a baking tray lined with baking paper. Bake for approx. 20 mins. in the centre of an oven preheated to 200°C. Keep warm in the switched-off oven. Bring the milk and stock to the boil, stir in the polenta, simmer for approx. 2 mins. over a low heat, stirring constantly to form a thick paste, season. 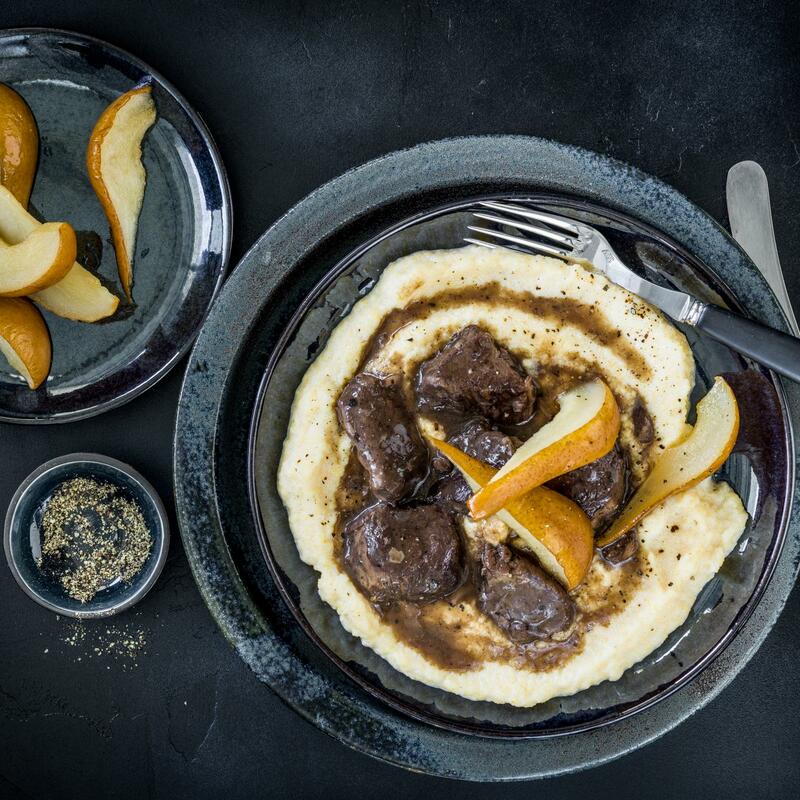 Plate up the polenta with the meat and pears.